The International Space School Educational Trust (ISSET) brought their Mission Discovery programme to Ayrshire for the second year running. The programme is intended to encourage youngsters to follow a STEM (science, technology, engineering and maths) career and is an amazing opportunity for school and college students to do something extraordinary by conducting research with actual astronauts, NASA personnel, scientists and engineers. This year’s event took place at Ayrshire College’s Kilmarnock Campus and was sponsored, in part by our club, on the suggestion of Alistair Tyre. Over the course of the week, twenty-two teams of students were instructed in space exploration, environmental issues, experimental techniques in space, leadership, presentation skills and team-building. The teams were then tasked with developing and presenting their ideas for small-scale experiments with a potentially significant contribution to scientific understanding. The winning team’s proposal was to investigate “the photosynthesis of phytoplankton in microgravity and the generation of electricity”. 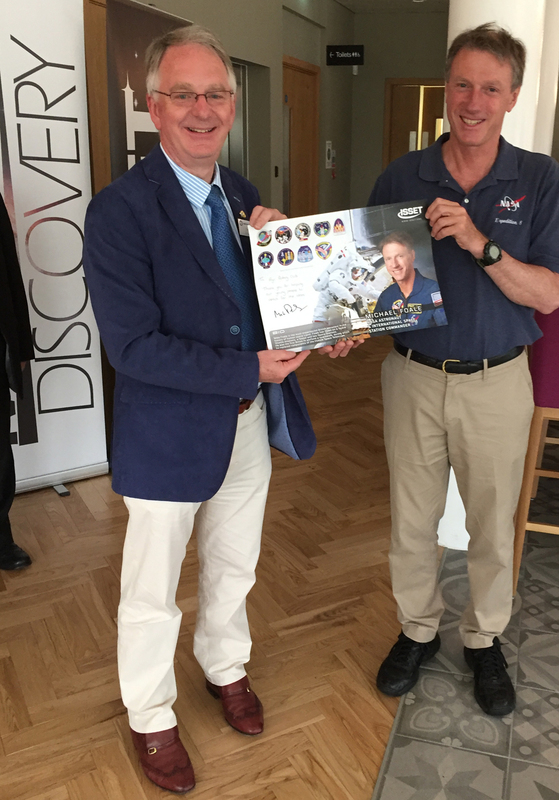 Throughout the week, a good number of us showed great interest in the proceedings and the photograph shows our new president Craig Wilson with former NASA astronaut Michael Foale CBE.